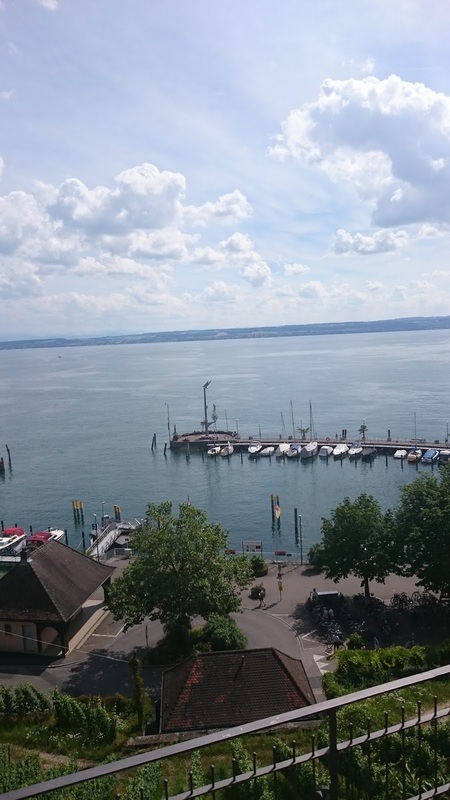 Nido's parked up in a Stellplatz in the town of Meersburg, by Bodensee, also known as Lake Constance. There's about 40 vans here and we have enough room on our pitch to put out the awning. It was touch and go as to whether we could stay here, as the ticket machine refused every card I owned and we didn't have €12 in coins - very frustrating. Cathy went to the market a few metres away to buy a couple of pretzels to get some change, so we were able to scrape together enough for a night, although we'd probably stay longer if we didn't have to find the coinage to pay. 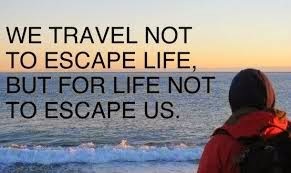 It's very frustrating when this happens as the majority of visitors are foreign and even the locals are unlikely to have bags of Euro coins to pay. With a castle looming over the lake and medieval houses lining the waterfront, Meersburg is a snapshot of the typical, fairytale Germany, with a pedestrianised Altsadt (old town). 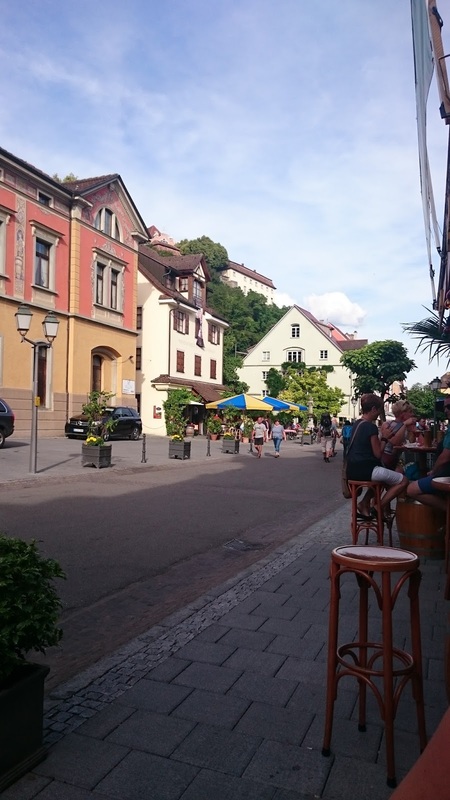 A short way downhill from the medieval Obertor gate is the small Markplatz, from where Steigrasse runs down past rows of touristy shops to the lakefront and Seepromenade. A lane parallel to the Steigrasse leads to the Altes Schloss and Neues Schloss, the formidable old castle and Baroque palace respectively, that dominate the upper town. 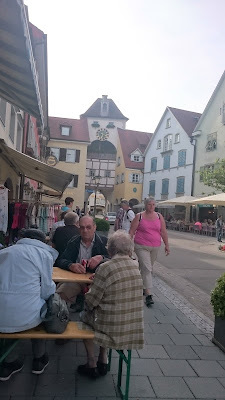 We left Donauwörth quite early this morning - the wind was still blasting through the trees. Having made the decision to leave the Romantische Strasse to the hordes of tourists, our journey to Bondensee was about 3 hours. We stopped by the lake at Friedrikshafen for lunch, then continued for another half an hour along the coast road to this Stellplatz. Hot and bothered, we had a cold beer under the awning. I chatted to the owner of the British van next door before we packed our swimming gear and walked into the old town. 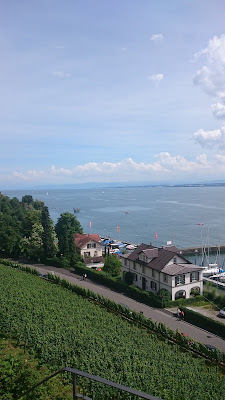 Meersburg is a very pretty medieval town, with a castle on the high cliff above and a great view of the lake. It's a hub for the many ferries that cross the lake. We saw a sign for the thermal-heated pool, so paid to enter. It was a lovely area, with a couple of very warm heated pools, plus easy access to the lake. There was plenty of warm grass to relax on, plus showers, changing pods and a bar. We were soon ready for a swim! The lake was quite warm and we really enjoyed swimming in fresh water, sharing the water with several ducks within neck-wringing distance! After a while we moved over to the thermal pool for a few lengths in the warm water. We joined the families to dry off and sunbathe and snooze on the grass, before enjoying another lake swim. We were finally chilled out. Dried and dressed, we walked through the lower town - quite touristy - but found a small bar where we ordered Currywurst and fries, sitting outside to eat with a glass of local wine. A short while later our Stellplatz neighbours - Ian and Helen from the Lake District - walked past. We sat together for a few drinks, chatting about motorhoming and travelling in general. They were a lovely couple and easy to talk to - enjoy the rest of your trip. Walking back up the hill, we sat outside with a brew in the warm evening, feeling very relaxed. 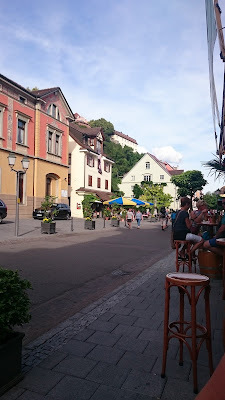 Ian and Helen gave us some tips for places to visit as we enter the Black Forest tomorrow. I think I'll need to do some serious cycling miles over the next few days to earn a big slice of Black Forest Gateau! PS - sat outside tonight with a clear sky, we saw the International Space Station fly overhead - a first for us. 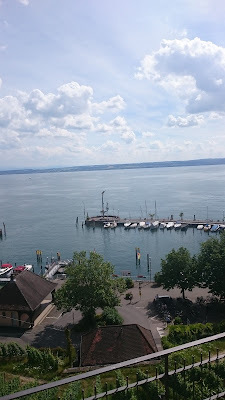 Our first view of Bodansee - get us in that water! 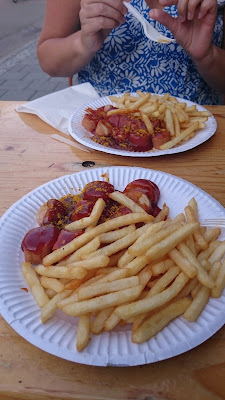 Our first official currywurst in Germany!